Cutting through the transparent membrane gives access to some of the internal abdominal organs. 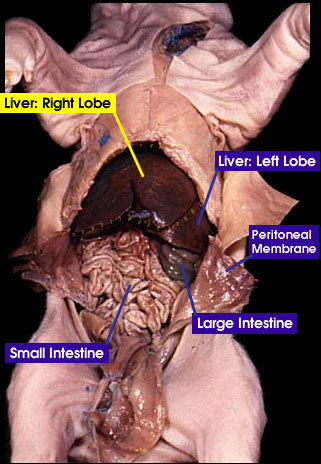 The cavity is dominated by the liver (large, brown organ at anterior of cavity) and the small intestine, but the large intestine may be visible. The abdominal wall to the left and right of the midline incisions and the umbilical region have been "reflected" (pulled aside to show beneath). The peritoneal membrane lining the inside of the abdominal wall appears shiny when wet.